The Itsy Bitsy Spider Crochet: Can you feel the excitement? Well, maybe it's just me -- but I'm getting so excited for the great Owl Crochet-Along. 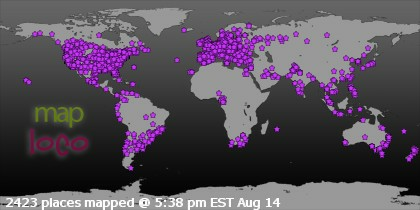 As of this morning, we have 39 people signed up to participate. What's even more exciting is that the first owl picture has already landed in the Flikr group! Stina, of getluckydesigns, says she knows she cheated and started early -- but I'm so glad she did! Her owl is a great example of how you can tweak a pattern and make it more your own. Stina's owl is made in lovely sky and slate blue colors and the sleepy eyes have adorable eyelashes -- what a fantastic addition, Stina! You still have until Sunday, May 30 to get in on the crochet-along so make sure to get yourself signed up! 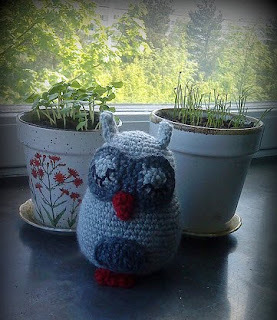 aw, thank you for the sweet words and for posting my little owl! i was so excited about the crochet-along and the pattern and just couldn't wait. i really love the pattern and will make many more during, and after, the crochet-along! thank you so much for sharing the pattern!